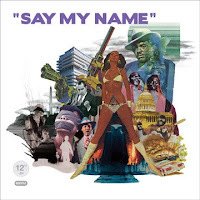 Lawrence, Kansas beat maker Say My Name released his self-titled debut EP yesterday on Range Life Records. Best known for his remixes for label mates White Flight and DRI as well as Hospital Ships, he also plays guitar in indie-rock band Fourth of July. The EP is an 8-song mix best played consecutively and on repeat as each song blends into another and features fractured synths and samples, found sound, and scratchy beats, all with a Blaxpoitation meets World Music vibe. 3. DRI - "What's Real (Say My Name Remix)" (SMN adds an old-school R&B style and a stuttering beat to a track from the solo project of Adrienne formerly of The Anniversary). Gnashing of Teeth - "Walking The Appian Way"
Kris N. - "Lo-Fi Movement"
Admiral Radley - "I Heart California"